A DIY book cover? Seems like a good idea, looking at theme of this month: Creative Desk. And it doesn't matter if you have a dozen of notebooks (like us) or if you like to read books.. there’s always a book to cover! That’s why today we’ll show you how to make a book cover. And not just a book cover.. but a cover from fabric! * Fabric for your cover (29 x50cm). We advise to choose the Cotton Basic fabric (a 100% cotton). This is a firm, sustainable fabric and you can order it for €7,99 at Motiflow with a unique print or with a self-designed print. Well begun is half done, so make sure you have all needed materials and gear near by. You can find an overview above. Also grab a drink and something sweet.. than we can start! First you lay down the fabric with the print downside. Fold the outer edge (for us the 29 cm edge). Pin the edge and after that, you stitch it. This way you get a nice finished edge on the inside of your cover. It can also be fun to chose sewing it with a bigger stitch. Turn around the fabric so the print lays upwards. Open your book, and lay it in the center of the fabric. If you are unsure if it’s exactly in the center, you can always measure the space left on both sides. Turn around the edges of the fabric. Pay attention: don’t fold them too tight, because there has to be some space left for putting your cover around the book in the end. Pin the edges on the top and bottom. Do this for both sides. Cut a little slit in the fabric, as you see on the illustration. Fold these edges and pin them. After that you can start sewing them. Pay attention that you sew it on the ‘blanco’ side and not the printed side! Sew the upper and bottom-side that you already pinned. Sew it all the way, so over the full width. This means you will not sew fabric to each other in the middle, but it will look more professional. While sewing, make sure you go exactly beneath the edge of the slit. 6. Turn it inside out and you're done! Turn the whole thing inside out and voila, you have your own self-made book cover! If necessary, you can press out the corners with a pencil to make them sharp. Try your book cover around your book to see the result! And.. don’t forget to share it with #diymotiflow. There's an age-old saying we should never judge a book by its cover.. but be honest: this does look way better, doesn't it? How fun is it to cover your photo book? Or your carefully picked weekplanner that you secretly don’t fancy anymore? Or go for a durable school year and make fabric covers for your school books. Easy to re-use next year.. saves time and money! An insect-print for your Biology book, pineapples for your holiday photobook or a sushi-print for if you happen to follow an extra lesson in Japanese (or you just like sushi very much). The basis of making a book cover always stays the same. Pay attention that you adjust the size to the size of your book. Finished? You can also pimp your cover! Sew an oblong pocket on the front, so you can always carry a pen with you. Or a wide pocket on the bottom for a gom. 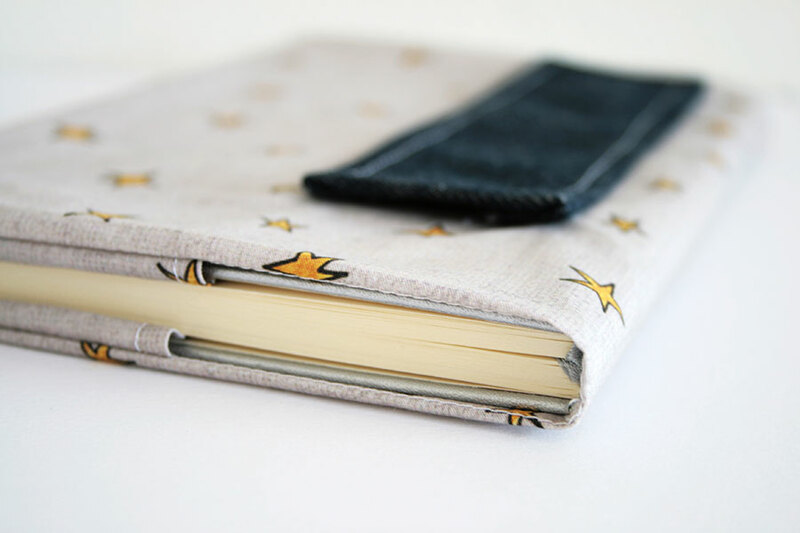 Making cover for your address book? Than you can save postages in the pocket as well! Are you going to make this DIY? Than share a picture with the #diymotiflow so we can like, share and see your creation.